cuteapps: CalculPro - CalculPro to practise mental arithmetic’s or fractions. CalculPro will help your elementary school students practice mental arithmetic or to do fractions. Choose addition, subtraction, multiplication, division or fractions; then set the range of numbers and the number of calculations for an exercise. The program shows you two numbers or fractions respectively, and you enter an answer. Right or wrong answers get audio feedback and there's a pie chart to show your percentage of correct responses. For a greater challenge, play against a friend or set a time limit for a correct answer. The performance of the students is stored in a data base. 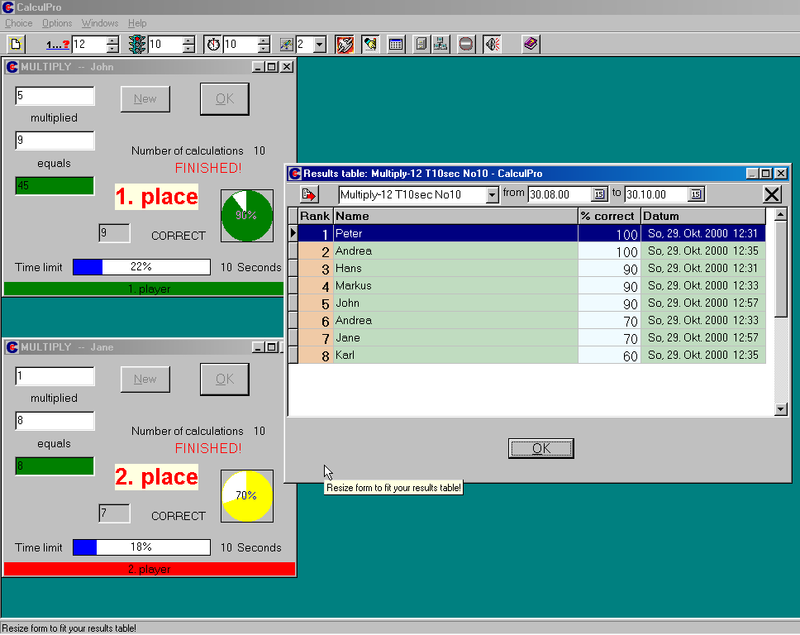 This allows a results table to be produced. It can be printed or exported as a text file. CalculPro is able to run on networks. This allows you for instance do a test with your students, using a local network and a common database. You may then evaluate the performance of your class automatically. Import of exercise data from one CalculPro - database into another is supported. The interface and sounds are available in English or German. More languages are supported.